Today is a big day for us LibDibbers. We have been live to Makers and Resellers for two years. Happy Birthday LibDib! When I think back to Day 1 (March 22, 2017)…wow! We have come so unbelievably far. LibDib is now a team of nearly 20 strong. We’ve partnered with the second largest distributor in the country to expand our operations and technology. We’ve improved our platform (thanks to feedback from our Makers) and we’ve added some useful features like digital orders, reorder reminders, live depletions, geo-targeting functionalities, and more. We’ve most definitely made a few pivots over the past two years, but our mission remains the same: to provide three-tier compliant distribution for any Maker who wants it, in any market, one case at a time. I will be the first to admit, the LibDib team has some work to do when it comes to ANY market. We launched WI this year and we’re working on expanding to more markets in 2019. The reality of the situation remains: it’s a big endeavor to expand to new markets. The licensing process takes time; however LibDib is committed to the mission and our amazing partners at RNDC are helping us as we go. As we expand and learn, the process is becoming more streamlined which is allowing us to move faster. 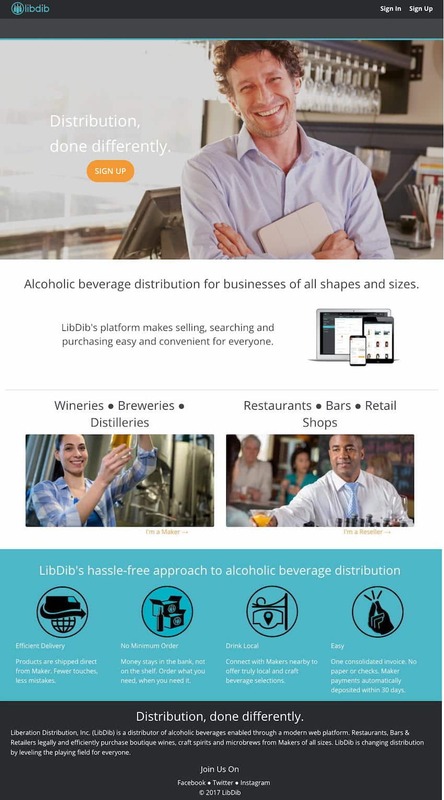 The Company: LibDib has become a great place to work. I’ve been reflecting recently on the company culture we’ve created. From Taco Tuesdays, Demo Fridays, the Ish-Bowl Speakeasy, to our now annual weekend offsite. We have a team of people who work hard, genuinely enjoy each other, and are 1000% dedicated to the mission and success of the company. Our Makers: I feel truly honored to have such a strong army of Makers who think similarly about their path to three-tier distribution. Our Makers are some amazing people. I love their products and we’ve been able to help a few along the path to growth and profitability for their businesses. The Resellers: Our Reseller Experience Team has built a network of incredibly influential retailers, bars and restaurants. These people truly support our craft Makers by bringing their message and products to the consumer. It’s a pleasure to facilitate these relationships and watch the magic happen. Growth: I took a look back on the blog post from last year’s one year anniversary, the progress is staggering. We now have over 4,500 products on the platform and hundreds of buyers in 3 different markets. It’s exciting to see where we’ve been and how far we’ve come. What a year it has been. Cheers to all that have made it happen. I can’t wait to see what’s around the corner next year.